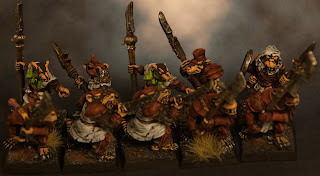 This is the last unit for the Skaven Army, not the last rats I paint, but the last unit. I might end up adding more to some units, but no more new units! Which to be honest, after painting so many... it's a relief. This is the only unit in the whole Army that can be considered as Elites. I have used the colours I usually save for characters or special units. The armour is red and the clothing is white/grey. The weapons are not as rusty and in bad shape as with the rest of the Army, just to show how rich they are. I have decided to paint the skin black because in 3rd edition you can have both, stormvermin and black skaven, but the only difference is that the stormvermin can carry double handed weapons and the Black Skavens Halberds, the description being the same, in the 4th edition they just merged these two units, so in the end, they are all black skaven with really dark fur. As for the figures, you can see I have a mixture of different editions. I got some figures from newer editions in a package I bought on ebay so I decided to paint them as well. They are bigger than the classical counterparts but still they blend in. You can see them together in the last picture. I have noticed some changes when mixing figures from different editions. The first one is the scale creep, the new ones are sometimes a head taller than the old ones. Aside from that, there is a big change in the equipment and apparel. You can see that 3rd ed. skavens are full of small details that make for a very colorfoul figure, small purses and bags, little pieces of warpstone, some coins or some skulls and so on; you are lucky if the the figures from the latest editions have one small bag or purse, and even in that case, only one! The new figures do not have the same personality as the old ones. 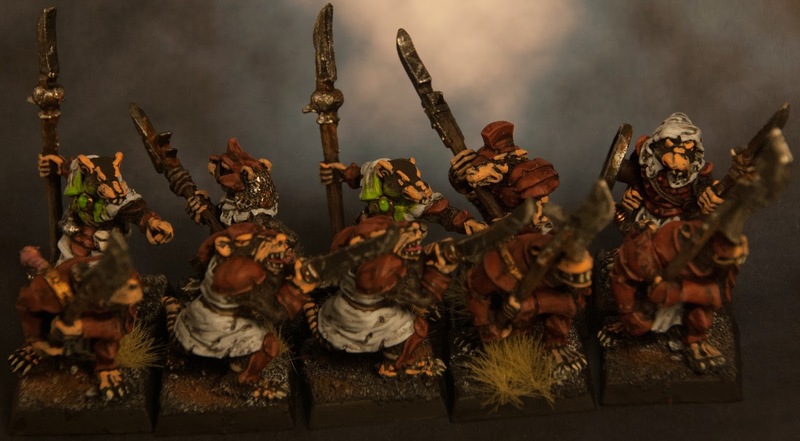 Armed with halberds this would be a black skaven unit in 3rd ed. for a total of 75 points and 115 points for 4th ed.